Imagine a raw wound the size of your palm on your arm. Now just rub the foulest dirt you can imagine into that wound. Do this twenty-four hours a day. Think that’ll be great for the rest of your body (let alone your arm!)?? Heck no, but that’s what we do every day, day in and day out if we have bleeding gums (“gingivitis”) or frank gum disease going down even deeper into the bone. And big congratulations to The View that just discussed this newly emerging information. Targets and diseases are listed below. Click next to them to read in more depth. This can give them a whole new perspective on health, wellness and quality of life. In fact, let us know and we can send you some ZT4BG cards to pass around. We need all the missionaries out there we can get! Sunday, January 04, 2009 For years there have been hints and hypotheses that heart disease and periodontal (gum) disease are associated or share common factors. Among the more humorous notions held by the uninformed press and public was that heart plaque and tooth plaque were somehow the same thing. That dubious notion notwithstanding there have long been provocative findings that have pointed to a relationship between a healthy mouth and a healthy heart. The first and most widely studied theory was that the bacteria associated with periodontal disease (most notably Porphyromonas gingivalis) somehow traveled through the blood stream and provoked an inflammation response in the heart. Indeed, one of the first large studies (9760 participants over 17 years) found that “those with periodontitis had a 25% increased risk of coronary heart disease relative to those with minimal periodontal disease.” The link became even closer when a subsequent study determined that treating gum disease resulted in improved endothelial function and blood flow. Since then there have been numerous other studies that have detected a statistically significant association between gum disease and a variety of biomarkers for heart disease such asC-Reactive Protein (CRP) and Lipoprotein-associated Phospholipase A2 (Lp-PLA2). One of the first direct links between periodontal and heart disease was found in a study that determined those with chronic periodontitis had higher triglyceride levels and a greater prevalence of small LDL a particularly powerful promoter of heart disease even among people with low cholesterol. The problem with these and many other studies is that it is often difficult to determine whether these similar biomarkers actually cause the disease or whether they are simply common indicators of a disease whose cause is some other common factor. It could be that people without gum and/or heart disease simply live healthier, exercise, eat better, etc., than those with either or both diseases! However, for the first time, a study has shown that treating even mild gum disease in otherwise healthy people not only improves endothelial function but significantly reduces carotid intima media thickness (CIMT). That’s right, they found unequivocal evidence that treating gum disease regresses a standard measure of atherosclerosis. To be fair, the study only looked at carotid arteries and not coronary arteries, it was a fairly small study (just 35 people), and CIMT is among these easiest markers of atherosclerotic lesions to regress. Head researcher Dr. Mario Clerici is quoted as stating, “The novelty of this study is that this is the first physical evidence that you can reverse a lesion that is already growing in the intima by doing something as simple as taking care of your gums . . . To tell you the truth, we were really surprised by the result, but it turned up in subject after subject.” The study involved nothing more than the simple removal of tartar and cleaning of the gums. There were no other procedures, no antibiotics or other prescription drugs or supplements, just the same basic dental hygiene measures you might receive at your dentist’s office. Researchers used Echocardiography of carotid arteries to compare baseline CIMT against measurements made at several time points after treatment. They also measured common inflammatory biomarkers associated with cardiovascular risk. The study treatments resulted in significant reductions in CIMT at multiple sites as well as reductions in bacterial load and of the inflammation biomarkers. For the record, there is still much to be learned about the connection between heart disease and dental health. To recap the study was small, it only looked at carotid arteries not coronary arteries, and CIMT is perhaps the easiest atherosclerosis marker to regress. Nonetheless, we have the first solid evidence that there IS a connection between heart health and dental health. The takeaway heart health hint here is that you have another reason to follow the age-old admonition to visit your dentist regularly for a cleaning and check-up. You will now have two reasons to smile – whiter teeth and a potentially healthier heart. But so many people think it’s natural and normal for their gums to bleed. “I know I’m cleaning really well if I can make my gums bleed.” “Oh, it’s just gingivitis.” And to that I have to ask, Do your elbows bleed when you take a shower? Well, they shouldn’t, and neither should your gums. And bleeding gums are often associated with some pretty unpleasant breath consequences. Try this little experiment if you dare: take a small piece of hamburger and put it in something like a baby food jar with a little water and some spit. Close the top and leave it in a warmish place for a few days. Now open the top: PHEW! Well, that’s exactly what’s going on with your gums if germs are allowed to attack them and if the body puts up its own hyper-response. But beyond bad breath there are a whole slew of effects on the whole rest of the body as the germs and germ waste-products seep down into the gums and then directly to the rest of the system: heart, blood vessels, lungs, kidneys, brain, reproductive organs, joints, etc., etc…. Some of these things can kill you. What this means is that treating gum disease has a beneficial effect on the health of the inside of your arteries. That’s BIG! ventilated, is among the most dangerous. onset of VAP in hospitals. This new high-tech tool? An ordinary toothbrush. be reduced by as much as 50%. direct correlation for intubated patients. bacterium that leads to VAP. change the position every few hours. nurses, should be added to the routine. NEW YORK (Reuters Health) – Among nursing home residents, having a nursing aide help them maintain good oral hygiene lowers the odds of them dying from pneumonia, a study suggests. Pneumonia is the leading cause of death in elderly nursing home residents, Dr. Carol W. Bassim and colleagues point out in the Journal of the American Geriatrics Society. “Several studies have shown that poor oral hygiene or inadequate oral care are also associated with pneumonia,” they add. Bassim, now at the National Institute of Dental and Craniofacial Research in Bethesda, Maryland, and her associates studied the impact of enhanced oral hygiene care for residents in two wards at a Florida nursing home compared with residents in two other wards. Initially, there was no difference in the mortality rate from pneumonia between the two groups. However, patients in the oral care group were older and more disabled than those who did not receive oral care, and once this was taken into account the risk of dying from pneumonia was more than three times higher in patients who did not receive oral care. Pneumonia in the elderly is often triggered by aspirating saliva or food. It is likely that the risk of pneumonia “depends on the quality and the quantity of the oropharyngeal contents of a patient at the time of respiratory inoculation or introduction,” Bassim and colleagues explain. SOURCE: Journal of the American Geriatrics Society, September 2008. And, keeping your gums healthy also saves money!
. OPEN WIDE Once again, Mom was right. For years she hounded you to brush and floss regularly to help keep your teeth and gums healthy. Little did she or anyone else know then that following her oral hygiene advice may also protect you from serious illness and disease. There’s growing evidence that gum or periodontal disease may put you at increased risk for heart attacks, stroke, diabetes and some cancers. In March, a study published in the New England Journal of Medicine found that treating severe gum disease can improve the function of blood vessel walls, improving heart health. The April issue of the Journal of Periodontology published studies that found periodontal bacteria in the arteries of people with heart disease and in the placentas of pregnant women with high blood pressure. Another study in that journal found that gum disease may predispose some people to developing early signs of diabetes. And earlier this year, a Harvard School of Public Health study of more than 50,000 men showed that those who had gum disease had double the risk of getting pancreatic cancer than those without gum disease. An estimated 80 percent of American adults have some form of periodontal disease, according to the National Institute of Dental and Craniofacial Research at the National Institutes of Health. The main cause of gum disease is bacteria, which is found in plaque, a sticky, colorless film that constantly forms on the teeth and tongue. Daily brushing, flossing, tongue scraping and other forms of interdental cleaning usually remove plaque to keep the gums healthy. But it doesn’t take long for sloppy brushing and haphazard flossing to lead to gingivitis, the early stage of periodontal disease. Characterized by swollen and bleeding gums, it’s reversible with professional treatment and diligent home oral care. Left untreated, however, gingivitis can develop into periodontitis, advanced gum disease. As tartar and plaque continue to build up, pockets form between the teeth and gums and the gums may begin to recede. As the pockets become deeper, the disease destroys more gum tissue and progresses to the bone, which can eventually cause teeth to become loose or fall out. The dentist, periodontist or dental hygienist can remove plaque through deep cleanings called scaling and root planing. If inflammation and deep pockets remain after cleaning and medication, it may be necessary to do flap surgery, which involves lifting back the gums and removing the tartar. Your periodontist may also suggest bone and tissue grafts to help replace or encourage new growth of bone or gum tissue destroyed by the disease. About three of every 10 adults over age 65 have lost all of their teeth because of cavities and gum disease, according to the U.S. Centers for Disease Control and Prevention. A number of studies indicate that the unchecked inflammation and bacteria in the mouth may be at the root of many problems throughout the body. The bacteria in plaque produce toxins that trigger an immune response and the release of chemicals called cytokines to wall off and kill the bacteria. The problem is, when too many cytokines are released, inflammation increases, damaging tissues in all areas of the body and causing increased blood pressure levels, high cholesterol levels and increased blood clotting, which can lead to potentially fatal heart attacks and strokes. Some researchers also believe that when periodontal bacteria travel from the mouth through the bloodstream, they may lodge in the blood vessel walls, triggering inflammation and causing the walls to thicken. A thickened blood vessel wall can increase a person’s risk of heart disease and heart attack. To save your teeth and your general health, stopping periodontal disease before it starts is critical, periodontists say, because you’re never cured. Even some of the insurance companies are figuring out that keeping the gums healthy can save them big bucks. Don’t be surprised if your MEDICAL insurance urges you or even forces you to show at least an attempt at getting gums healthy. Smarter companies like Aetna and Blue Cross seem to be moving toward providing benefits to encourage better gum health. Some physicians, like doctors of the joints are requiring patients to get a dental clearance before performing surgeries like hip or knee replacements. diminished attachment around the teeth. But it’s never too late to start taking care of your teeth and gums. The following factors may increase your risk of developing periodontal disease. Periodontists offer tips on how to counter them and save your teeth and your health. Most dental experts recommend brushing at least twice a day, morning and night, and flossing at least once a day, preferably before bed. Have your teeth professionally checked and cleaned at least every six months. Because tobacco can dull the immune response and decrease the amount of oxygen in the mouth, smokers are two to seven times more likely to develop periodontitis than nonsmokers, says the American Academy of Periodontology. “When you smoke, the first biological tissue the hot (tobacco) gasses come in contact with are the gums,” says periodontist Dr. David Richards, who advises everyone to quit smoking. Up to 30 percent of the population may be genetically susceptible to gum disease, the academy says. Despite aggressive oral care habits, these people may be six times more likely to develop periodontal disease. If your parents have had gum disease, tell your dentist and hygienist, who may recommend more frequent cleanings and special mouth rinses to reduce the plaque. People who have diabetes tend to have more severe gum disease and get it earlier than non-diabetics. Gum infections can impair a diabetic’s ability to process and/or use insulin, which may cause the diabetes to be more difficult to control and the periodontal infection to be more severe, resulting in a greater loss of bone and connective tissue. Diabetics need to tell their dentist and hygienist about their condition and be vigilant about oral care and blood sugar management. During puberty, pregnancy and menopause hormones are changing, and these changes can affect tissues in the body, including gums, which can make them more susceptible to gum disease. “With hormone change, the tissues overreact to plaque and can cause more gingivitis, more puffiness and bleeding of the gums,” says Sigafoos, who notes the problem can be controlled with good home oral care and professional cleanings. “Grinding or clenching the teeth softens the bone around the neck of the tooth, and it’s easier for the infection to spread and the bone and ligaments to be injured,” Sigafoos says. If you know you grind your teeth, talk to your dentist about getting a mouth guard to wear when you sleep. Some drugs – including oral contraceptives, anti-depressants and a few epilepsy and heart medicines – can affect your oral health. Tell your dentist or periodontist about all medications you’re taking. A diet lacking important nutrients can compromise the body’s immune system and make it harder to fight off infection, including periodontal disease. According to the American Academy of Periodontology, the bacteria that cause periodontal disease can pass through saliva. This means the common contact of saliva in families puts children and couples at risk for contracting the gum disease of another family member. “Gum disease is communicable if the person you’re giving it to has deep enough pockets (between the teeth and gums) to harbor bacteria,” Sigafoos says. And as doctors and dentists now suspect, gum disease is no little thing. Research compiled over the last five years suggests that gum disease – especially if the condition has persisted for a long time without treatment – can contribute to diabetes, cardiovascular disease and stroke, pregnancy complications, and perhaps even Alzheimer’s disease, osteoporosis and some types of cancers. Infections in the mouth also may increase the risk to people undergoing several types of surgery, including transplantation and cardiac valve replacement. But as recently as last month, a study published in the New England Journal of Medicine found that treating severe gum disease can improve the function of blood vessel walls, improving heart health. And in this month’s Journal of Periodontology, two studies found periodontal bacteria (bugs normally found in inflamed gums) in the arteries of people with heart disease and in the placentas of pregnant women with high blood pressure. 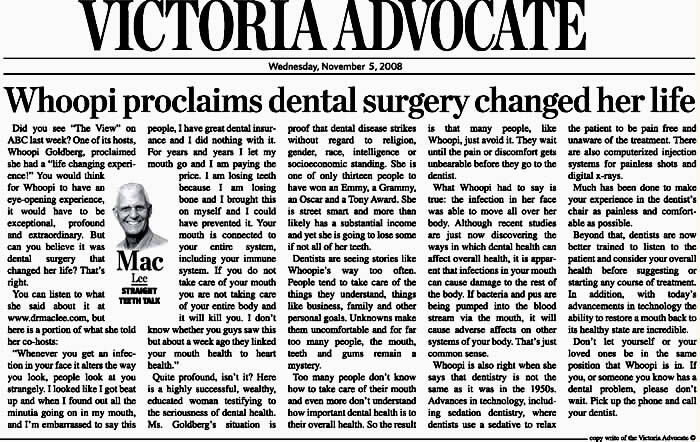 It’s still too soon in the evolution of this research to say with certainty that gum disease directly causes other illnesses. But the evidence is compelling enough that it’s beginning to unite dental and medical professionals – two groups that have had only a nodding acquaintance. And it’s leading to one of the most sweeping changes in the dental insurance industry in more than a decade. Several health insurance companies – particularly those that offer both dental and medical insurance – are beginning to offer free or low-cost “enhanced” dental benefits to certain high-risk patients who might experience broader health benefits by having a cleaner mouth. Gum problems begin when the bacteria in plaque, the sticky film that forms on teeth, persists long enough to inflame the gums. Usually, inflammation is considered a positive response to bacteria – a sign that the body is fighting back. But if inflammation rages unchecked, it does more harm than good. The majority of Americans have gingivitis, an inflammation of the superficial structure of the gum that can be a precursor to gum disease. Although good brushing, flossing and favorable genetics can limit the extent of gingivitis and keep gum disease at bay, this condition of persistent inflammation affects 30 percent to 40 percent of American adults. Of those, about 10 percent have advanced cases that damage the structures (ligaments and bone) that support the teeth. Other than bleeding, gum disease has few symptoms and rarely causes much discomfort. “The gums do not hurt until it is too late,” Amar says. One of the most well-established links between gum disease and secondary infection, for example, is among people with mitral valve heart defects. Doctors have long warned valve patients to take antibiotics before teeth cleanings so that the bacterial disruption in the mouth will not travel through the bloodstream to infect the valve. There may be other ways that poor gum health causes trouble elsewhere in the body. Doctors at the University of Southern California have connected a common virus, cytomegalovirus, to gum disease and complications in kidney transplantation. About 20 percent of all failed kidney transplants are related to cytomegalovirus infection, according to Hessam Nowzari, director of the periodontology program at USC School of Dentistry. Research shows that inflamed gums can be a reservoir for the virus. Although gum disease could worsen many conditions, experts and dental insurance companies are most interested in heart disease, diabetes and pregnancy – conditions in which successful periodontal treatment could yield ample benefits. Studies surveying large groups show that people with severe gum disease have significantly higher rates of cardiovascular disease. Besides influencing the function of blood vessel walls, byproducts from the bacterial infection can enter the bloodstream and trigger the liver’s release of a substance called C-reactive protein, studies have suggested. C-reactive protein is thought to inflame arteries and promote blood clot formation. Intriguing links can also be drawn between gum disease and diabetes. Diabetics tend to have more severe gum disease and have it at an earlier age than people without diabetes, research shows. Having gum disease increases the amount of time a diabetic’s blood sugar remains high. But diabetics who receive good periodontal treatment have a better response to diabetes therapies. “We’ve known for years that diabetic patients who have periodontal disease do not respond to therapy,” says Miller. But it’s still too early to say if aggressive treatment of gum disease in high-risk individuals could have a big effect on other illnesses. A study published in November in the New England Journal of Medicine serves as a cautionary tale and shows why much more research on this subject is needed. “There are a number of criteria that have to be met before we can conclude that something is a cause,” he says. A developing health science aims to prevent disease by focusing on mouth bacteria. You might be surprised to learn that the microscopic bugs around your teeth that cause gum disease may also contribute to tongue cancer, medical researchers recently reported. Such a link would not, however, shock the legions of oral health professionals paid to clean teeth and gums, restore teeth and scare patients into flossing daily. Mounting evidence linking gum disease and other physical ailments is bucking the long-held notion that the mouth and body should be treated as separate entities by different kinds of doctors. Scientists already have associated periodontal disease with heart disease, diabetes, respiratory illness and several pregnancy-related problems including infertility, preeclampsia, and premature and low-birth weight babies. The science is young and inconclusive, however. What’s not yet known is whether diseased gums actually cause or contribute to other illnesses, and whether prevention of periodontal disease — through regular exams, cleaning and good oral hygiene — could actually prevent or lessen the effects of other health problems. Still, these associations are convincing enough to spur more aggressive general health screenings in dental offices and to prompt insurance companies to offer enhanced benefits for employees at higher risk for periodontal disease complications. “This area is very exciting, leading to a growing awareness of the importance of good oral health, not just for appearance’s sake, but for longevity and life,” said Jeff Album, director of public and government affairs at Delta Dental, an insurance company with an enhanced periodontal benefit for pregnant members. What isn’t disputed is that the mouth is loaded with microorganisms, and is home to hundreds of species of bacteria that can be both useful – as in digestion – and destructive, as in gum disease. These bugs collect to form sticky plaque, also called “biofilm,” which nestles between teeth and builds up along the gum line. Ignored, it can cause gingivitis (inflammation of the gums), and progress to periodontitis, an infection that causes disintegration of the bone and tissue that support teeth. As the theory goes, untreated periodontitis can wreak havoc on other body systems, either through the spread of bad bacteria from the mouth to the rest of the body or because of the inflammation caused by that bacteria. The inflammation occurs when bacteria give off toxins that stimulate the immune system to produce cytokines. Cytokines in turn induce inflammation. Mine Tezal, a dentist and researcher at the State University of New York, believes either one of those mechanisms may be at work in tongue cancer development, and possibly other types of oral cancer, as well. She notes that bacteria or viruses have been implicated in other malignancies, including cancers of the colon, cervix, lung and stomach. Working with researchers at the Roswell Park Cancer Institute in Buffalo, N.Y., Tezal compared 51 white men with tongue cancer to 54 white men without tongue cancer. Mouth X-rays assessed each patient’s periodontitis by calculating bone loss in tooth cavities. The researchers found that bone loss was markedly higher in the men with cancer. Even after adjusting for age, smoking history and number of teeth, they found a more than fivefold increase in the risk of tongue cancer in those with bone loss. While Tezal can’t explain the possible association, she hypothesizes that the microorganisms or their products can cause mutations in genes leading to cancer or that they stimulate cytokine production, creating an environment for tumor development. Tezal points out that her research, published in May in the Archives of Otolaryngology-Head & Neck Surgery, needs to be followed by larger studies before any solid conclusions are drawn. Regardless of the state of the science, dentists today routinely look for evidence of other diseases before dealing with a patient’s periodontal problems. The reverse also may be true. A Danish study conducted in rats found that having periodontal disease can contribute to the progression of Type 2 diabetes in susceptible patients. Another recent study, this one adding to mounting evidence linking heart disease with gum disease, was published in the New England Journal of Medicine in March. It found that when severe gum disease is aggressively treated, there is eventual improvement in the function of blood vessel walls – at least in the brachial artery along the arm. Problems in coronary artery function can signal the onset of heart and vascular disease. Carmichael dentist Laurie Hanschu, who closely follows the emerging science, said she is fascinated but wary about claims of links yet to be firmly established. Still, she said, treating periodontal disease is likely beneficial to a patient’s overall health. That’s why each of her new patients undergoes a thorough medical evaluation, including a lengthy medical questionnaire. Tanya Boyd of Granite Bay sought out Hanschu for her first dental appointment in five years – something she avoided after a terrifying experience with a hygienist she said had a car mechanic’s touch. For her first visit, she was scheduled for teeth cleaning and whitening. She left without either. Instead, Boyd got an hourlong exam that included X-rays, photos, cancer screening, jaw joint checks and probing for tartar below the gum line, exposed roots and inflammation. “I’ve never had an exam like that,” Boyd said with both surprise and relief when it was over. Boyd also left with four more one-hour appointments for in-depth periodontal cleaning called root planing and scaling, in addition to the whitening. The insurance industry also is paying close attention to the scientific findings, and generating some of its own. Insurance giant Aetna, in collaboration with Columbia University College of Dental Medicine, found that patients with heart or vascular disease or diabetes lowered their overall medical costs when they got early and regular dental care. The company now targets members it considers at risk, encouraging them to take advantage of their dental benefits, which include enhanced services such as additional cleanings. “We feel confident that the medical costs and long-term dental costs will eventually be lower,” said MaryLee Conicella, national director of clinical operations for Aetna Dental. Inflammation isn’t pretty. And it often hurts. But the tell-tale swelling and ache, the redness and heat are signs that our bodies are fighting back against microbial invaders that might otherwise harm or kill us. Inflammation is our first line of defense and sometimes, it now seems, our worst enemy. In multiple sclerosis, lupus and rheumatoid arthritis, the body turns upon itself with often catastrophic results. But the danger is not limited to these classic inflammatory diseases. Increasingly, scientists are linking inflammation to an expanding list of disparate and sometimes surprising diseases, from Alzheimer’s, autism and asthma to cirrhosis, cardiovascular disease and cancer. The evidence is compelling. For example, the Women’s Health Study, a landmark research program involving almost 28,000 women, has found that women with the highest measures of inflammation in their blood face a seven-fold increased risk of heart attack or stroke. Sufferers of inflammatory bowel disease have a five-to seven-fold higher incidence of developing colon cancer. And studies have shown that people who take anti-inflammatory drugs seem to get Alzheimer’s disease later in life than those who do not. “Inflammation may be driving a lot of what we’re seeing, in a lot of different diseases. It may be that the things that cause these diseases are related to inflammation,” said Dr. Barrett Rollins, chief science officer at the Dana-Farber Cancer Institute in Boston. The basics, though, are pretty well-known. Inflammation is the body’s biggest weapon, the biological equivalent of shock and awe. It is meant to overwhelm and destroy an enemy – regardless of collateral damage – in an effort to secure quick and total victory. The fundamental process is the same whether you’re sneezed upon by someone with a cold, inhale a snoutful of allergenic pollen or cut your finger. For illustration purposes, let’s say the last happens, triggering a cascade of events known collectively as innate immunity. Sentries called mast cells in the injured finger (they’re stationed everywhere) detect the presence of pathogens and sound the alarm, secreting proteins called cytokines to summon help and histamines to make nearby capillaries suddenly porous. The leaky blood vessels flood the wounded area with plasma, producing swelling and discomfort, but also isolating pathogens from the rest of the body and slowing their spread. Soon, the body’s immunological warriors, a class of white blood cells called phagocytes, arrive. They are meat-eaters. Their job is to engulf and digest foreign material, including dead and dying cells. As the phagocytes work, they secrete more cytokines, summoning more reinforcements and provoking greater and sharper symptoms of inflammation. Their fight will rage on until there is nothing left to kill or eat. Under normal circumstances, said Geert Schmid-Schoenbein, a UCSD professor of bioengineering, “once the infection is cleared up, inflammation goes away.” The phagocytes die. The wound heals. Tissues return to normal. Only sometimes the process doesn’t stop. Sometimes inflammation smolders like a fire within. It becomes chronic, though its consequences might not be immediately noticed or felt. Why this happens is not fully understood, but the tally of known or suspected causes of chronic inflammation is long and growing. Some people appear to be genetically predisposed to chronic inflammation. Obesity is a huge factor. Fat cells, researchers have discovered, produce and spew their own pro-inflammatory cytokines. The fatter you are, say scientists, the bigger the threat of chronic inflammation. Bacteria and viruses provoke an inflammatory response, and when they linger in conditions like gum disease and stomach ulcers, they foster a chronic inflamed state, even though the sufferer may initially feel no ill effect. Numerous environmental and external stimuli have been linked to chronic inflammation. Among them: asbestos, smoking, coffee, alcohol, birth control pills, some medical treatments such as hormone replacement therapy, even prolonged or recurrent bouts of anger, hostility and depression. It has only been in the last decade – and most keenly in just the last few years – that researchers have begun to identify chemical biomarkers that signal inflammation even when symptoms are not present or obvious. These biomarkers tend to be the working elements and products of inflammation: the various proteins, chemicals and cells that, in a normal, healthy state, are present only in modest amounts, if at all. The current poster child of inflammatory biomarkers is C-reactive protein, a tool of the inflammatory process thought to help white blood cells bind to foreign and damaged cells. Higher-than-normal levels of CRP, however, have been connected to a number of diverse diseases and conditions. For example, men with the highest levels of CRP have a three-fold increased risk of heart attack and a two-fold increased risk of stroke compared to men with the lowest levels. Obese people have elevated levels of CRP, as do people suffering from macular degeneration, an age-related condition in which central vision gradually declines, often leading to blindness. The question is whether elevated CRP causes disease or simply reflects a diseased condition. Researchers don’t yet know. It may be a combination of both, depending upon the disease. More and more, researchers suspect inflammation is at work in heart attacks. In one widely held scenario, white blood cells attempting to clear away arterial plaques of cholesterol inadvertently damage healthy tissues as well. This escalates the inflammatory process until one or more plaques burst, blocking an artery and causing either a heart attack or stroke. Likewise with Type 2 diabetes, which afflicts almost 16 million Americans. The disease is characterized by the inability to produce, use or regulate insulin, a hormone that transports sugars from the blood into cells for energy. Obesity is the biggest risk factor for developing diabetes, and here, too, inflammation plays a villainous role. Dr. Steve Shoelson, of the Joslin Diabetes Center in Boston, has found that obese people accumulate fat in their livers. Excessive levels of fat cause a protein in the liver called NF-kB to be activated. NF-kB turns out to be a kind of master switch for starting the inflammatory response. Shoelson thinks the resulting chronic inflammation disrupts the body’s ability to process insulin, leading to diabetes. In experiments, Shoelson has activated the gene that produces NF-kB in mice, triggering inflammation. Though the mice are lean and apparently healthy, they display symptoms of diabetes. Some forms of cancer are clearly exacerbated, if not caused outright, by inflammation. For example, in gastroesophageal reflux disease, the lining of the esophagus is routinely doused with stomach acid, causing inflammation and heightening the risk of esophageal cancer. One of the products of inflammation is oxygen-free radicals – unstable and highly reactive molecules that damage or destroy anything they touch, friend or foe. Some researchers have speculated that free-radical damage to healthy cells and their DNA sometimes results in cancerous mutations. The resulting tumors are then fed and nurtured by inflammatory growth factors intended to spur wound repair. Similar explanations are proposed for neurological disorders such as Alzheimer’s and autism. Biochemist Jeffrey W. Kelly and colleagues at the Scripps Research Institute in La Jolla, for example, have hypothesized that inflammation could disrupt normal neuron activity, causing amyloid beta proteins in the brain to misfold. Such plaques have been strongly linked to the development of Alzheimer’s. A study published last year by researchers at the Johns Hopkins University School of Medicine reported the first direct evidence linking brain inflammation to autism. They examined brain tissue from 11 people with autism who had died of accidents or injuries. They found that, compared to normal brains, the autistic brains contained abnormal patterns of cytokines and chemokines – indicators of inflammation. Samples of cerebrospinal fluid taken from six living children with autism showed elevated levels of cytokines. Whether the inflammation causes or contributes to autism or is the result of the brain attempting to fend off some other damaging process remains to be determined. Revelations of inflammation’s links to many diseases have opened up new possibilities for drug therapies and treatments. New drugs are in development, and approved drugs are being given new jobs. Statins, for example, are used to lower cholesterol and reduce inflammation. They are being tested for their efficacy in treating Alzheimer’s disease and sickle-cell anemia, in which red blood cells become misshapen and cause painful clots. And then there’s aspirin, which is now widely prescribed in small, daily doses for people at risk of cardiovascular disease. But aspirin has its drawbacks, including side effects such as internal bleeding when used in large doses over extended periods. Shoelson will soon launch long-term clinical trials on an alternative that avoids aspirin’s shortcomings. Salsalate is an aspirin-like drug already approved for treating arthritis and related inflammatory conditions. Preliminary studies have shown that it improves insulin sensitivity and lowers blood glucose and lipids after just two weeks of use. Shoelson and colleagues think it may help prevent diabetes. “We are trying to determine if the drug may help in people who do not yet have diabetes, but are overweight and at risk to develop disease,” said Dr. Allison Goldfine, of the Joslin Clinical Research section and, like Shoelson, a Harvard professor. Other researchers are investigating the use of COX-2 inhibitors, anti-inflammatory drugs like Vioxx, Celebrex and Bextra. The problem with these pharmaceuticals, of course, is that they may create other problems. Merck withdrew Vioxx from the market last year after it was linked to increased risk of heart attack and stroke. An FDA panel has since ruled that Vioxx can be sold with a stronger warning label. At UCSD, Schmid-Schoenbein has focused on shock with Tony Hugli, of Torrey Pines Institute for Molecular Studies, and David Hoyt, of UCSD. A major cause of death in hospital emergency rooms, shock can cause massive, rapid organ failure when the body suffers inadequate blood flow, often due to severe trauma. In shock, when blood flow drops dangerously low, digestive enzymes escape into the wall of the intestine, peritoneal cavity, lymphatic system and bloodstream, where they break down tissues, causing organs to fail. Understanding this sequence of events, said Schmid-Schoenbein, means doctors can now search for ways to preserve the intestinal barrier, perhaps by introducing drugs to inhibit or block digestive enzymes. Better remedies, though, will take time, researchers caution. Inflammation is a tricky business. “When you block some of the inflammatory reactions, you’re also blocking part of the repair process,” said Schmid-Schoenbein.